PARIS — Trying to quell its most serious political crisis, the government of President Emmanuel Macron announced on Tuesday that it would suspend the gasoline tax increase that had set off three weeks of increasingly violent protests in Paris and around France by the so-called Yellow Vest movement. 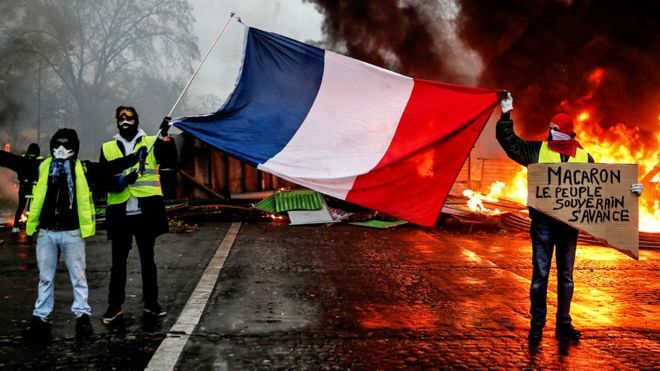 The step was an extraordinary concession by a president who has been criticized as remote and unempathetic, and who has refused to bend to previous protests and plummeting poll numbers as he pushes through changes that he insists are necessary to make France’s economy more competitive. 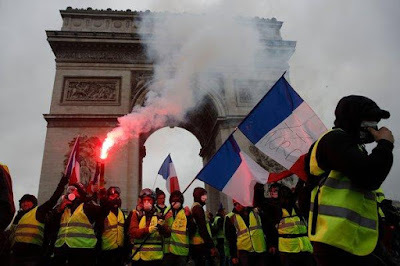 Whether it was enough to appease the Yellow Vests’ varied complaints about the declining living standards of the French working class was far from clear. But there was little doubt that the gesture was intended as a nod to widespread anger over perceived economic injustice, and to blunt the momentum of a popular revolt that now threatens Mr. Macron’s agenda. The Yellow Vest movement has been named for the roadside safety vests adopted by its protesters as a symbol of their distress and despair. The gas tax increase, which was scheduled to start in January and was equivalent to up to 25 cents a gallon, proved to be a tipping point in a country that already has some of the highest taxes in Europe. 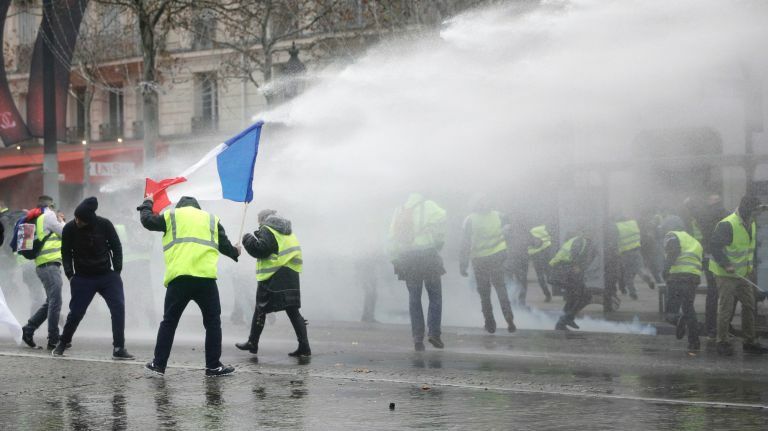 It spurred thousand of protesters into the streets of Paris and other cities, many from small villages and towns where stagnant salaries, steep utilities costs and onerous taxes have squeezed working families. The third weekend of demonstrations on Saturday turned violent around the country and especially in Paris, where protesters fought running battles with riot police officers, set cars on fire, shattered store windows and attacked banks. The protests, responsible for millions of dollars in property damage and lost tourism revenue, have highlighted a deep socioeconomic split in the country. “Right now, I’m at zero,” Mr. Girardin said. His wife had done the shopping with 40 euros the day before, a Wednesday. Now there was nothing left to get them through the weekend. “You get to the end of the month, there’s nothing,” he said. UPDATE: An official with the Elysee palace told The Associated Press on Wednesday that the president decided to get rid of the tax. Prime Minister Edouard Philippe told lawmakers that "the tax is now abandoned" in the 2019 budget, and the government is "ready for dialogue." The budget can be adjusted or renegotiated through the course of the year. We should remember that people can have different ideas about how to fight climate change. Many climate change activists think that we can't do anything about climate change without making fossil fuels much more expensive and thereby weaning ourselves from them. That may be true. But it is unpopular politically. Very few people win national office by telling voters that they must be ready, willing and able to double, triple and quadruple their costs for energy in their home or their transportation. What is collectively rational may not be individually rational. This will always be a weakness in any system that has individual input into politics. It might help the planet if we all drove less. But since I need my vehicle to get to work I will probably think you should drive less and pay more tax, not me. But either way, this French incident wasn't just about climate change. It was also about people feeling they were taxed enough already, that their wages/income weren't growing enough to deal with higher taxes, and that metropolitan politicians weren't in touch with people outside their bubble. When faced with a very direct obvious present day cost and a more diffuse possible future issue, people will care more about what impacts them here and now. Politicians have to remember this or risk losing their job.